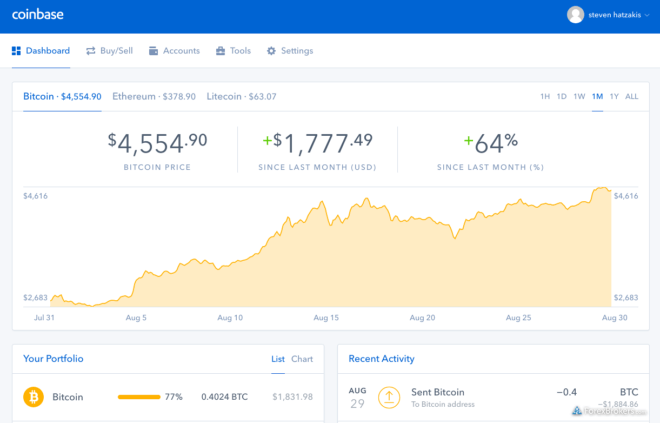 CoinBase Review - demo, fees, strategy and more! CoinBase is a US-based broker, made to sell and buy cryptocurrencies for fiat money (currently Bitcoin, Litecoin, Bitcoin Cash and Ethereum for US dollars and euro). Their website doesn’t allow trading of binary options or forex (it only allows buying and selling cryptocurrencies). Despite of this drawback, the company is pretty important. Why is it? Read on. If you want to buy or sell any of the above cryptocurrencies, CoinBase represents a top in the industry. The buying process is simple. All you have to do is to sign up, verify your account by taking a photo with a webcam and deposit money using your credit or card (instantly) or through a bank transfer (takes 2-5 days) to your registered account. Within a couple of seconds, you can start buying cryptocurrencies. You can also buy other cryptocurrencies directly without having to convert your money into bitcoin and then into your desired cryptocurrency. CoinBase platform is not one of the super-sophisticated ones. Which is a good thing. The platform is so simple that it can be handled by everybody with some basic knowledge of English. Below you can find the screenshot of the system. 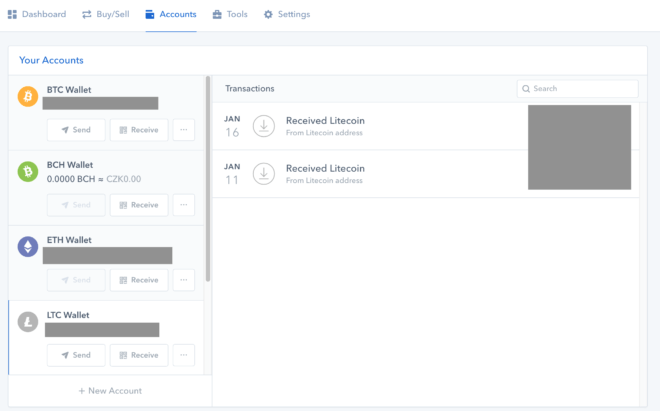 The spread offered by CoinBase is minimal However, you must pay a small fee. In the above picture, you can see that when buying bitcoin worth 500 USD, the fee will be around 3.8 %. Taking into account the extreme growth of bitcoin throughout 2017 (i.e. by more than 1000 %) a fee worth a few per cent is a negligible amount. The value of your cryptocurrency may rise by tens of per cent within a single day, which far exceeds the fee. The system of CoinBase exchange is simple. Your account allows you to access several wallets. No matter which cryptocurrency you want to use – BTC, ETH or LTC – the process is always the same. These wallets allow you to receive crypto from another exchange (such as Bitfinex or Kraken exchange), from a bitcoin ATM, simply from anywhere. After that, you can keep the coins at the CoinBase exchange, send it to someone else or exchange it for fiat currencies (euro, usd) or another cryptocurrency. If, instead of selling, you want to buy a cryptocurrency it’s all very simple. Simply move on the top line to “Buy/Sell”. Add your preferred payment method (most likely payment card) and select the amount you want to spend on your selected crypto. Although the keeping of cryptocurrencies in wallets and at crypto exchanges such as CoinBase is practical, it is not recommended due to safety reasons. Having this in mind, don’t keep the crypto on your account longer than necessary. Many people tend to ignore this recommendation, which is a bad habbit. CoinBase offers an attractive bonus. If you register by clicking on the button below and buy any cryptocurrency for 100 USD or more, you will receive account bitcoins worth 10 USD for free. Why does CoinBase offer such a bonus? Well of course, in order to lure new traders to its platform. As mentioned above, CoinBase charges a small fee for each transaction and knows that this will pay off. Same as other exchanges, CoinBase requires verification. The process is simple and quick. Select Start Verification to open up your webcam. Place your personal ID (citizen pass) against the camera from both sides one after another and click OK. Within a few hours (max. a few days) you will receive an e-mail notification of the completed transaction. In case of failure, don’t worry and retry your attempt. If your second attempt fails, try to download a mobile app and take photo by using this mobile app. This method should work under any circumstances and it is pretty nicely explained on the webpage.